Top Rank Promotions returned to pound for pound star Terence Crawford’s home state of Nebraska to promote his attempt to unify the WBA/WBC/IBF and WBA Junior Welterweight Titles. The Pinnacle Bank Arena in Lincoln, Nebraska was the host site for tonight’s ESPN telecast. The undercard featured stars such as Bryant Jennings, Mike Alvarado and Mike Reed fought on the undercard and emerged victorious. The first bout of the night was between former Olympian and prized prospect Shakur Stevenson (2-0) and David Paz (4-3-1) in the super featherweight division. Stevenson, a southpaw, opened up the fight with quick, accurate combinations while staying outside of the range of Paz. His counter right hand and right uppercut was finding it’s home in the second round, and Stevenson was finding success going to the body in the third round. Paz was clearly outmatched and lost his mouthpiece in the third round, had his knees buckled from a straight left hand in the fourth round, and was knocked down from a straight left hand in the fifth round. Stevenson probably had some opportunities to finish the fight but wasn’t able to capitalize it. He won with scores of 60-53 on all three scorecards. The next bout of the night was in the light heavyweight division between Oleksandr Gvozdyk (13-0) and Craig Baker (17-1) in the light heavyweight division. Gvozdyk’s nickname is the “Nail” and he had a lot of hype coming into this fight. Baker kept a high guard early and Gvozdyk seemed content to stay behind his jab. Gvozdyk wasn’t very impressive in the first three rounds of the fight but was doing enough to win the rounds. Baker was able to land some punches in the fourth round but wasn’t able to match the work rate of Gvozdyk. Gvozdyk landed some heavy shots at the end of the fifth round and he started to move away from using his jab. The end came in the sixth round when Gvozdyk landed a short right hand that sent Baker down. Baker was able to get back to his feet and told the referee he wanted to continue, but Gvozdyk immediately jumped on Baker with unanswered combinations and forced the referee to stop the bout. Oleksandr Gvozdyk wins by TKO at 2:04 of the sixth round. The main event of the evening was between Terence Crawford (31-0) and Julius Indongo (22-0) for the WBA, WBO, WBC, and IBF Junior Welterweight Titles. 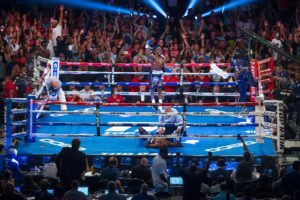 Indongo entered the ring first and was greeted by the chorus of boos from the Nebraskan crowd. Terence Crawford decided to walk in through the crowd instead of the usual ring walk on the ground and was greeted warmly by his fans. Indongo looked like he was several inches taller and longer than Crawford. Crawford, despite traditionally fighting in an orthodox position, came out fighting as a southpaw. Crawford opened up the fight by landing a counter left hook and Indongo answered with a looping and wide lead right hook. Crawfrod was able to stay out of the range of his taller opponent and was accurate with his counter hooks. Indongo kept his jab in the face of Crawford at the start of the second round but Crawford was able to time Indongo and land a hard left hook followed by a right uppercut. Crawford was able to roll with Indongo’s punches and land a left hand that sent Indongo down to the mat. Indongo looked like he was still buzzed when he got to his feet but survived the round. Indongo, to his credit, started off the third round aggressively. Crawford however was able to stay calm and counter a combination by Indongo and land a hard left hand to the body that sent Indongo crashing to the mat writing in pain. The referee counted to ten and Indongo was unable to get up. Terence Crawford wins by knockout at 1:38 of the third round.